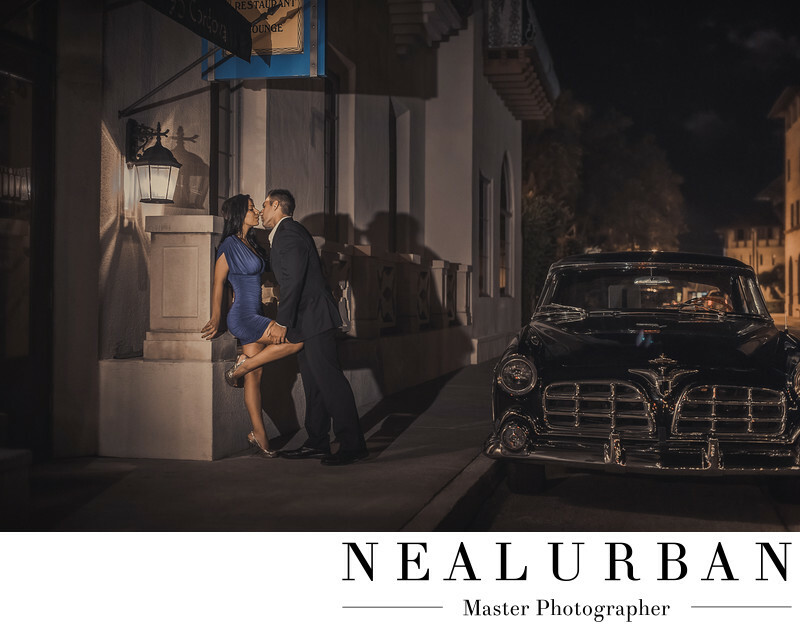 We travelled to St. Augustine, Florida for Rick and Deanna's engagement session. They were living in Florida and really wanted us to come down for the photos! We were actually planning a trip that way and told them the timeframe we were looking at. It was going to be perfect timing for this destination engagement shoot! It was toward the end of October. We began the session at St.Augustine Lighthouse. It had to be the hottest and most humid days in Florida. There was a man selling water at the bottom of the lighthouse. Neal wanted to go all the way up. I have asthma and was not doing to great. Let's just say the man gave me the entire cooler of water! What a nice guy! I made it up just as Neal as finishing at the top. He told Rick and Deanna I was having a really hard time breathing and may not make it up. They were super cool about it too! Then we headed to the old town of St. Augustine. It was absolutely breath taking there. The architecture was amazing! It was so old and had a Spanish style vibe. I wish we could have stayed there all day! For this part of the engagement session, we all just walked around and did the photos at locations we saw along the way. Neal is a big fan of old cars. We came across this car and Neal had to use it for a photo. We wanted this shot to look high end fashion as well! Rick and Deanna both looked stunning and like models. They could pose with no direction too! We told Deanna to lean up against the building and Rick leaned in toward her. I love how she is bracing herself on the wall! It adds some drama to the image. We added some light to their faces and then noticed we could get a cool looking shadow. The outside light on the building also helped create this! Since we did not know the owner of the car, we didn't want to get too close. It was pretty expensive. The image turned out even better than we had hoped. We weren't sure if we like the placement of everything. Once the lighting was added in and Rick leaned in, we knew it was going to be good! This lovely couple ended up moving home to Buffalo. They had their wedding at Salvatore's Italian Gardens. We got even more amazing images that day! We did photos at Ellicott Creek Park! Location: 95 Cordova St, St. Augustine, FL 32084.